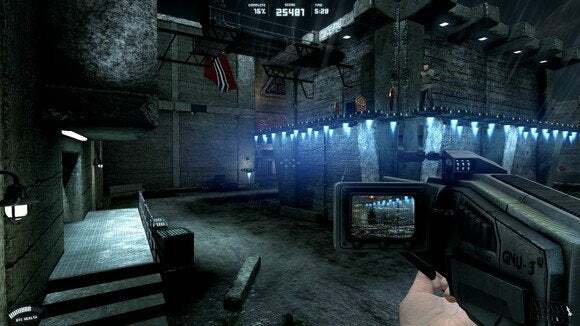 I may never beat Rise of the Triad, Interceptor Entertainment's new reboot of 3D Realms/Apogee’s classic 1994 shooter. On the other hand, I don’t think it really matters. For the last two hours I've been fruitlessly tossing rockets, missiles, and all other sorts of explosive objects at a twelve-foot-tall robot named NME, only to have him mercilessly murder me at the last minute. I feverishly jump back into it again, knowing I'll most likely die at the exact same point. The game seems to look at the way I’ve let my circle-strafing skills atrophy over the last decade and sneer. I'm not being dramatic—it actually mocks me. “Stick to a gamepad,” the voiceover taunts and I hang my head, all too aware of how piercing and knowing the insult is. Rise of the Triad is the sort of unabashedly over-the-top action game where if everything isn't on fire, you're probably doing something wrong. No, I'll probably never beat Rise of the Triad, but that's beside the point. Rise of the Triad revels in being nigh-unbeatable, and I’m fine with it—even if I have no real desire to develop the skill required to win. In that sense, the game perfectly recaptures the blend of skill and masochism needed to master the twitch-shooter genre. This is not a case of a reboot adapting to modern design tropes. Rise of the Triad takes modern game design, throws it in the garbage, lights it on fire, shoots it with a rocket launcher, and then does whatever it wants instead. And it’s fantastic. Rise of the Triad is a throwback to a time when games were, more often than not, simply games. A time when people who wanted games that aspired to be “art” were the weird ones. Oddly, by adhering to this singular vision of classic gaming Rise of the Triad becomes more a work of art than many contemporary games with loftier ambitions. That is, if you don’t mind painting with blood and kerosene. Rise of the Triad is an unapolegetically bombastic game. Everyone explodes. Practically everything explodes. You collect giant coins with Ankh symbols emblazoned on both sides, solely to score more points. You fight the Nazis—except they’re called Triads! Yes just like the 1994 original, a guy in a Nazi uniform by any other name is still a Nazi: a remnant of the franchise’s origins as an expansion pack for Wolfenstein 3D. If you need dumb bad guys for a self-consciously dumb action game, you can't do much better than dumb Naz—sorry, "Triads." This is a game for people who remember Wolfenstein 3D, who flip dual middle fingers at the thought of tactical shooters, who cackle at the mere thought of controversy surrounding violence in games, who consider regenerating health a ruinous gimmick, and who lament that “rocket jump” has slipped from our cultural lexicon. Does that demographic even exist? Hell if I know. There’s a good chance every person who fits that mold worked on this game. It doesn’t matter. What matters is that you understand upfront: Rise of the Triad is pure insanity, a game that’s dead serious about not being taken seriously at all. This is a reboot of the game that pioneered ludicrous gibs. You should know what you're in for. You want story? Here’s your story: strap into the boots of one of the six members of H.U.N.T. (High-risk United Nations Task-force), an elite cabal of soldiers trying to infiltrate the Triad's island compound and take down those evildoers. Wait, you want more story? Then you’ve come to the wrong game. This is about as much story as you'll see the whole game. Hey, remember how the last thirty minutes or so of Commando is just Arnold Schwarzenegger running around an island paradise/terrorist compound murdering people? Oh yeah, and remember how he kills a guy by using a saw blade as a Frisbee? Rise of the Triad is basically that sequence made into a game. When I played Fallout 3 I fired a mini-nuke one time just to watch it explode, laughed, and then reloaded so I could save all my nuke ammo in case I needed it for a boss later. I never did. When all you have is a rocket launcher, everything looks like a shack full of explosives. If, at any given moment, you don’t have a rocket launcher in hand you are probably playing Rise of the Triad wrong. Unless, of course, you’re using the baseball bat with eyes embedded in it that lobs exploding baseballs, or the wizard staff that shoots lightning. Or you’ve collected the “God Mode” pickup and can vaporize enemies with your hand. Or you've turned into a dog with a supersonic bark attack. It's a dog-eat-dog world. Or dog-eat-Triad. Or dog-eat-rocket. After picking one of five characters, all of which move at superhuman speeds between “blisteringly fast” and “I-might-throw-up,” you’ll begin sprinting through labyrinthine terrorist compounds full of ridiculous traps, blowing up enemies and generally causing a ruckus. At the end of each level you’re scored on how many enemies you killed, how many coins you collected, how long you spent in the level, your remaining health, and how many secrets you discovered. This game does not hold your hand. Eschewing the last ten years of first-person shooter design, your character will not regenerate health like a gun-toting Wolverine knockoff. Instead you’re forced to scramble after bowls of “Monk Meal” and “Priest Porridge” like some sort of ravenous rector, gaining back a pitiful amount of your health with each bowl. Sometimes, these bowls of food light on fire; dumping that fiery mess down your gullet actually restores more health. No logical explanation is given, or expected. You can set porridge on fire with your arsenal to make it restore more health. No matter how gluttonous you are, you will die often. And, if you're anything like me, you will love it. Then hate it. Then probably love it again. Then give up, slam your hand into your desk, vow you’re quitting forever, only to come back an hour later convinced you’ll do better this time. “You probably won’t do better,” the game says, laughing at you. I’m happy to report that multiplayer is just as, if not more, chaotic than the campaign. The multiplayer maps are beautiful and well-designed, though there aren't many to choose from. If you’ve ever played older Unreal Tournament or Quake you’ll immediately feel at home. I hope that’s pretty much all I have to say for you to know whether or not this sounds appealing, as I’m absolutely terrible at multiplayer Rise of the Triad. All the hallmarks of single-player make it in, from high-flying jump pads to a myriad of rocket launchers and insane powerups. Arenas are well-crafted and seem balanced, though more map selection would be welcome—there are only a handful as of release. What the new and improved Rise of the Triad really captures is…well, Rise of the Triad. All of the stuff I mentioned above? Those were key aspects of the original game. The items, the enemies, the powerups, the secret rooms—all faithfully adapted from their 1994 counterparts. The humor remains intact—shamelessly '90s-esque, but not painfully forced the way Duke Nukem Forever was. If you don’t like the soundtrack, well, you're crazy, but you can dig into the options menu and switch to the classic 1994 version. Even the levels are based off the originals. Everything—from the jump pads to the rocket launcher—are shameless tributes to the original Rise of the Triad. Interceptor has spoken in the past about their passion for the original Rise of the Triad, and it shows. This game was obviously made with a ton of love and care, and given the trials the development team overcame to get the finished product out the door it’s almost a miracle that Rise of the Triad exists at all—some of these events are even chronicled in the game’s loading screens, i.e. four computers were lost during development. I’m glad the game came out. Interceptor knew exactly what game they were making with Rise of the Triad, and I commend them for it. It’s not necessarily a game I’ll ever be good at, or a game I’d typically play these days, but I love it anyway. Rise of the Triad is a glorious ode to rocket jumps, circle-strafing, and twitch shooting. It’s a surprisingly faithful adaptation of a 20-year-old game that feels utterly refreshing to play. This game is literally insane—in the best way. You can play as a skeleton smoking a cigar in multiplayer matches. Boss battles present overwhelming difficulty spikes. First-person platforming is still terrible.